The modern mobile phone can fulfil a dazzling array of gadgetry wants, enabling us to take photographs, send video messages and surf the Internet, but what about our basic needs – have mobiles adapted to the needs of the visually or hearing impaired? With today’s advanced technology, you’d think mobile phones catering to the needs of users with physical disabilities, such as impaired vision or hearing, would be commonplace. However, mobile exclusion has proved to be a widespread problem. A study carried out at Cambridge University found that around 40 million adults in Europe – about 9% of the adult population – encounter difficulties in using mobiles. They could have a disability that inhibits their hearing, dexterity or vision – 2 million UK citizens are visually impaired - or they might just be getting on in years and their facilities are not as sharp as they once were. Either way, these people are as much entitled to the enormous benefits that mobiles can offer as anyone else. However, the big mobile manufacturers such as Nokia and Motorola have yet to recognise and exploit this sizeable hole in their marketplace – although Vodafone did at least try, launching an easy-to-use model in 2005 called Simply that failed to find its audience. It has been left to small specialised companies such as the Austrian Emporia to help fill in the gap. For mobile phone users with hearing or vision difficulties, there are a few specially designed handsets that make the task a lot easier. With its large text, high contrast screen and big well-spaced buttons, the Emporia Life model is a good option for partially sighted users who want the text messaging facility. It is also ideal for those over 50 that don’t want fiddly little buttons or their handset to be stuffed with an inordinate number of useless features. Its loud speaker specially tuned for easy listening and extra strong ring vibration could also benefit the hearing impaired user. Other types in this category include the metallic coloured EasyUse and the larger than average sized BigEasy 2, which has back-lit buttons that are each at least 1cm square and the Doro HandleEasy 326, which is incredibly easy to use and looks rather like a classic calculator. There are also models available for those that are not able to use a screen at all. The Easy5 mobile is perhaps the most basic on the market. There’s no screen, just two call buttons and five large number keys, which the user can press to connect with their five most important telephone contacts. The Owasys 22C is a talking phone that is designed specifically for blind and partially sighted people. As well as the familiar easy to find and tactile keypad buttons and absence of a screen, this device has in built speech facility, where by a computerised female voice talks through all of the phone’s functions. As this may not be everybody’s cup of tea, the Royal National Institute for the Blind (RNIB) offer a free, no-obligation Try Before You Buy scheme. Of course, not everyone will be happy with the idea of having a ‘special’ type phone, particularly young people who want to keep up with the trends and not single themselves out as being different. Speech software offers a way for visually impaired users to keep their flashy modern phones but still be able to use them effectively. Nuance TALKS™ Premium, for example, runs on Symbian-based mobile phones and converts the contents of the display into speech, thereby allowing users to access all the phone’s features. It can read out call lists or received messages and even browse the Internet. We’ve highlighted some of the phones available that cater for blind or partially sighted people but what about the most unlikely user group of all, the deaf or hard of hearing? Surely mobile phones are off limits for these members of society? On the contrary, the mobile phone has proven to be a huge success in the UK’s deaf community. The Short Messaging Service (SMS) function has become a valuable form of communication for people with hearing difficulties. The brevity of texts makes conversations difficult, and necessity for sending lots of messages could potentially be costly, but there are alternative options available. 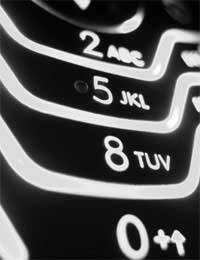 The move towards Internet-accessing phones will see short texts disappearing along with their limitations. For those users that are partially deaf, there are many accessories available that can assist mobile hearing, such as induction loops or hooks, which can increase volume and cancel out any noise interference.